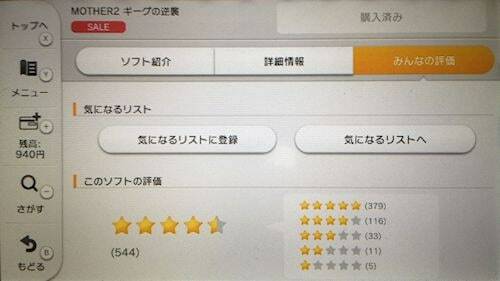 While browsing around on my Japanese Wii U I noticed there was a section that listed how players rated MOTHER 2 in different ways. So here’s a look! Who do you think this title appeals to? What kind of play style is this title more suited for? This sounds about right to me – how about you? I kind of wish there was more feedback info than just that, but I guess maybe that’s what the Miiverse is for, huh? 16 people rated less than two stars for Mother 2. Seriously? I think Mother 2 is more suited for a casual play style. I’m not sure in what sense they meant casual and intense play styles though. In Japanese, the text is less like “intense” and more like “Something I want to play as a deeper experience” or “Take my time and really savor”. Sorry, I meant three stars instead of two stars in my previous post. Also, sorry again. Writing my third post. Oops. Hope y’all don’t mind. Thank you for the explanation, Mato. Now I think I’d choose “Intense” rather than “Casual”. i really want to hear why people rated it 2 and 1 stars. ^It’s cool. I can’t even count the posts I’ve made just today. Personally I think people should talk more in the comments. Of course if Mato asks me to write less for some reason, I will. Sorry Nintendofreak, I meant that to respond to Ronald. I can’t believe that people can think it that bad either. I kind of have one hypothesis though. Early on if you don’t know to goo equipment, it could be somewhat hard. It was a little frustrating my first time. I don’t necessarily think that this is the reason for all the bad ratings, but maybe like one or two. Bit off topic but now that the dust is settling on Mother 2 Miiverse wise (Itoi doesn’t seem to be posting at all anymore) anyone think it may be time for U.S. and other region fans to start possibly begin thinking and brainstorming about starting some kind of effort towards making our wish for EB’s VC release elsewhere more vocal to NCL (because as has been discussed before, petitioning NOA is probably a complete waste of time and resources at this point)? I really like the “postcards to Iwata” idea that Mato mentioned. I really think we need to start striking while the iron is still hot. I definitely agree with that. 4.5 seems like a pretty solid score for the game,and the 77% Everyone and 79% “Intense” (take your time with) scores sound about right. Because while anyone can play the game, it’s not like Tetris or Animal Crossing where you really want to just pick it up and mindlessly play for a while- Earthbound requires a bit more investment than that. I would say, yes. Just about anyone can play this game. Especially, and particularly people who don’t play video games. Casual isn’t the right word to describe Earthbound. I’m sure intense is either. I would describe the game as an “investment” (like someone above mentioned) or “involved.” Truth be told. It’s my favorite game of all time, and when I first played it, I didn’t really like video games at all. This game made me appreciate what a videogame can do. I think EarthBound (err, Mother 2…) is a game that everyone could enjoy. They just have to put time into it to get the most out of it. Also, I guess that most of the players are really people who bought the original Super Famicom cart and are willing to relive their nostalgia. 30 yen (30 US cents according to Google as of now) for a great game that can really inspire you is not a great deal. It’s overkill. BreakingBenny: I take it that you may not have been alive or aware when this game was originally released. The “toilet humor” campaign was par for the course at the time, as it was popular with kids- shows like Ren and Stimpy were popular at the time, and it would have been similar to the “extreme” movement of the early 90s. More reasonable factors in Earthbound’s failures was the inflated price of the cartridge due to the guide, the stylized graphics (Americans were obsessed with graphics, and only graphics at this time period), the general lack of interest in RPGs in the American market at the time- it was improving, but Final Fantasy VII made it mainstream- a lack of interest in Japanese culture (anime was scarce to nonexistent in America at this point), and the release of the game late in the SNES’s lifespan. So, as you can see, there were plenty of factors that pointed to Earthbound’s poor selling- NoA’s Ad campaign wasn’t the greatest promotion, but it was hardly the single most driving factor behind the game’s poor sales. America simply wasn’t ready for a game like Earthbound yet. My bad. “Extreme” movement of the early 2000s, not 90s. I think this data is pretty good, Mato could you post how many people have actually downloaded the game. 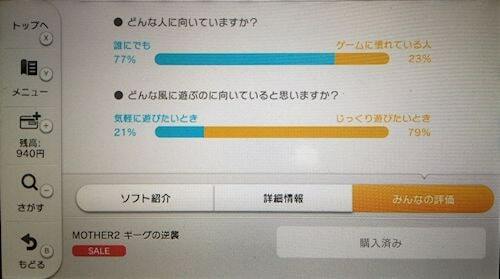 That would help to see if they would even think of localization. Is there a way to tell that? Tomato, don’t they still report total sales for digital games? I was trying to use my google-fu to get some sales figures but I am unsuccessful so far. NoA’s advertising was generally pretty mild, except for that “Play It Loud” era (1994-95). It’s just that after watching SEGAAAAAAAA!! having success with their big-attitude marketing, Nintendo got the idea that just being gross was the same thing. I don’t believe Earthbound is a game for everyone, and I don’t look down on those who don’t like it. Jontron is one of the most vocal gamers in that he does not like the game at all. @Bucky What!? Why does Jontron dislike (or even hate) Earthbound?! When did he say that? Again, it’s not for everyone. In a sense, it’s a fluke that it’s become so popular now. I don’t know about that, I’ve seen quite a few ads from the early to mid-90s that seem pretty “extreme” to me. Proto-extreme maybe? Gotta agree. Extreme stuff got its start in the mid-90’s, but I would argue it was marketed more toward the young adult to pre-teen audience. It trickled down to the 6-10 crowd around the turn of the millenium.